As you must know, I have been a brother of Delta Sigma Pi, an american professional fraternity for almost 2 years now. Time flies! I must admit I would have never imagined how great was this community! I came back to France in May, 2014. It was terribly sad to leave my roomates, my friends and my brothers. We had a special link together. Delta Sigma Pi became a huge part of my american life. Every week, I had the opportunity to meet for a special executive meeting on Sundays and I also discussed with the brothers and the pledges about my culture, my life and my career. Last week, I had the pleasure to have dinner with one of my DSP brother, Anna, in Paris. She is currently in France for a Summer School in Strasbourg. This is how the exchange program works: American people come for 2 months while we go to the US for two semesters. She arrived in Paris on Thursday morning and I met her at the Anvers station at 7pm the same day… Anna was very tired but also excited to visit the city. We walk to the Moulin Rouge and then we got into the metro in order to go to the « Bourse » station. 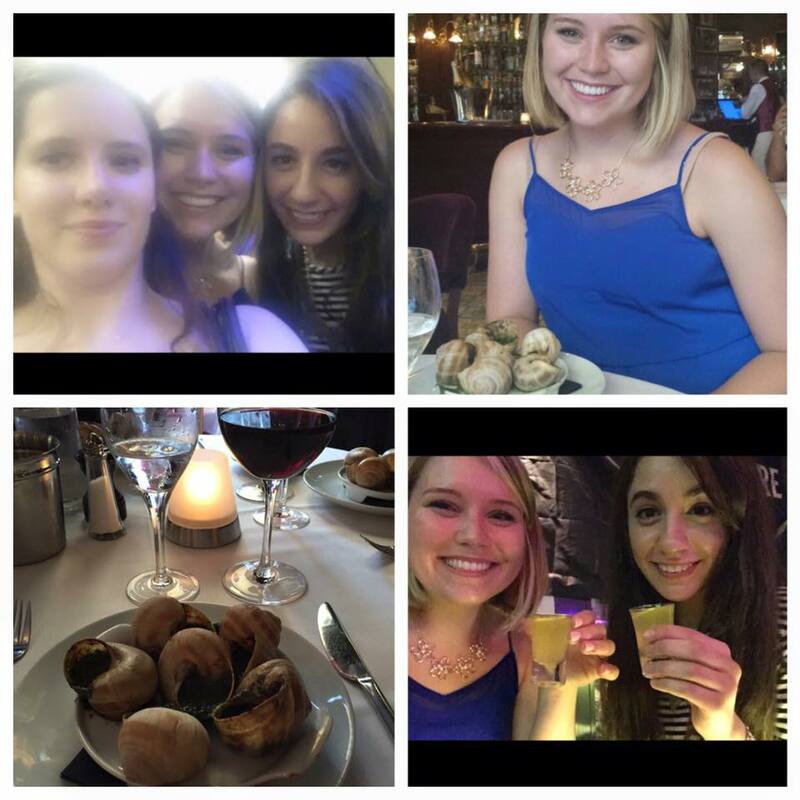 Then, I took her with her friend Stephanie to a French restaurant named « Brasserie Gallopin ». She reminded me good memories, I was so nostalgic! They tried to eat snails! And actually, Anna loved them! It was a great moment. Afterwards we ate delicious main dishes (fresh meat !) and we ended up our dinner with fantastic desserts! This moment shows me that people in the US were not only present for me when I was in the US. They are here whenever I need it. I hope Anna will enjoy her trip in France and above all studying at the EM Strasbourg school !! Vous le savez sûrement mais l’EM Strasbourg organise des Summer School très fréquentes dans les pays étrangers pour permettre aux étudiants de venir étudier en France pour 6 semaines. Cela permet ainsi de renforcer les liens avec plus de 180 universités partenaires dans le monde !